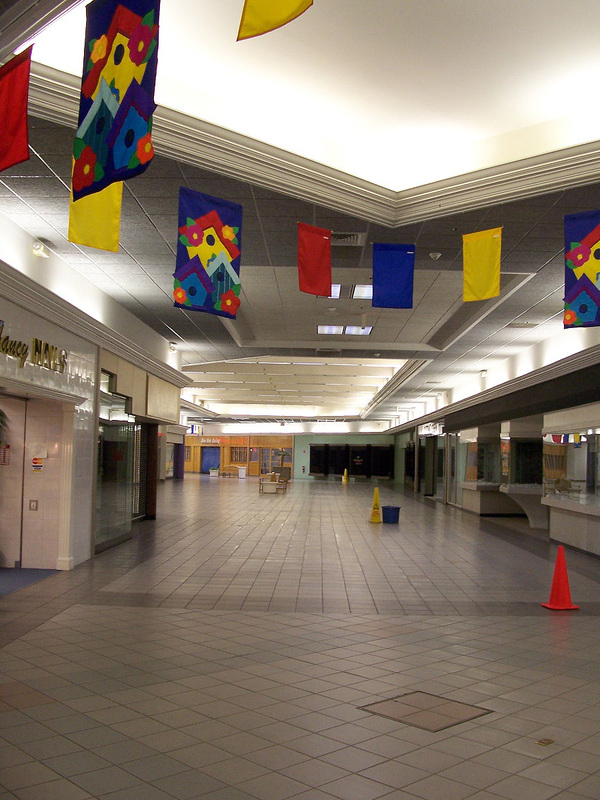 Most of the attention in the “dead mall” phenomenon has focused on large, once-thriving (and often, once-dominant) malls that were done in by changing demographics or newer competitors. On the whole, the smaller malls are seen as necessarily casualties, centers that never really worked or aren’t large enough to miss. Strangely, I’m as fond (if not more fond) of these little guys, and it seems that an awful lot of the regular readers of Labelscar feel the same. 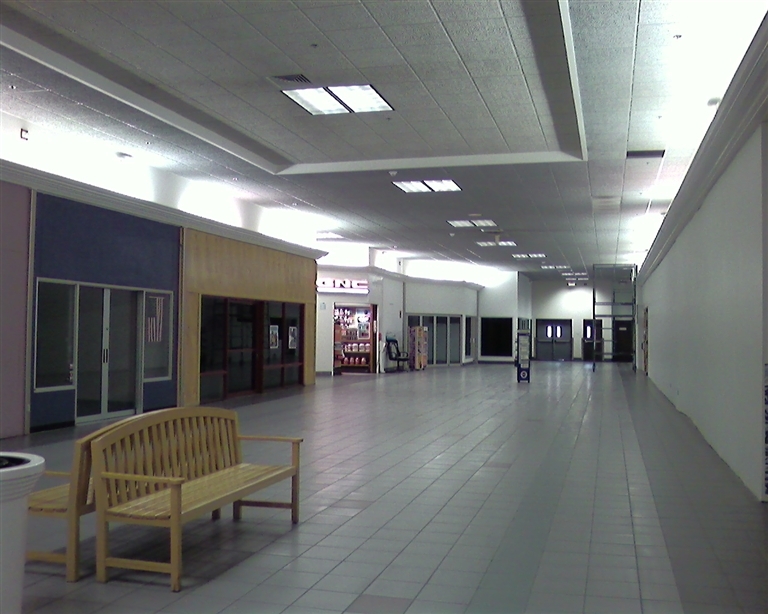 On that note I present to you the sad little Norwichtown Mall, in Norwich, Connecticut, a deeply troubled 241,000 square foot mall that I doubt has much life left in it. The Norwichtown Mall opened just off (present day) routes 2, 32, and I-395 in 1968 to serve the Norwich area of eastern Connecticut. While eastern Connecticut is one of the more rural areas of the northeast megalop, Norwich is one of the larger cities in the area, with a population of just under 40,000. However, the loss of the manufacturing industry (and the frequent ups and downs of the defense related jobs in nearby Groton and New London) hit Norwich particularly hard, and it has suffered from a malaise worse than many similar cities throughout New England. Today, however, the mall sits in the relative shadow of two of the largest tourist attractions on the east coast: Mohegan Sun and Foxwoods Casinos, which are each about 10 minutes away from Norwichtown Mall. Before the region’s dominant mall, the large Crystal Mall, opened in Waterford to serve the entire New London-Groton-Norwich metropolitan area, there were two malls to serve each of the region’s two anchor cities. The appropriately-named New London Mall was the first enclosed shopping mall built in Connecticut, and was opened on the north Frontage Road of I-95 in New London. I’m pretty sure–though not certain–that the mall opened in 1958, with the first Bradlees store as one of its anchors (I suspect, though am uncertain, that a Sage-Allen was the other anchor). Sadly, this grand old relic–which remained very dated until its death–was demolished in 1998 to be replaced with a relatively bland strip mall that stands in its place today. 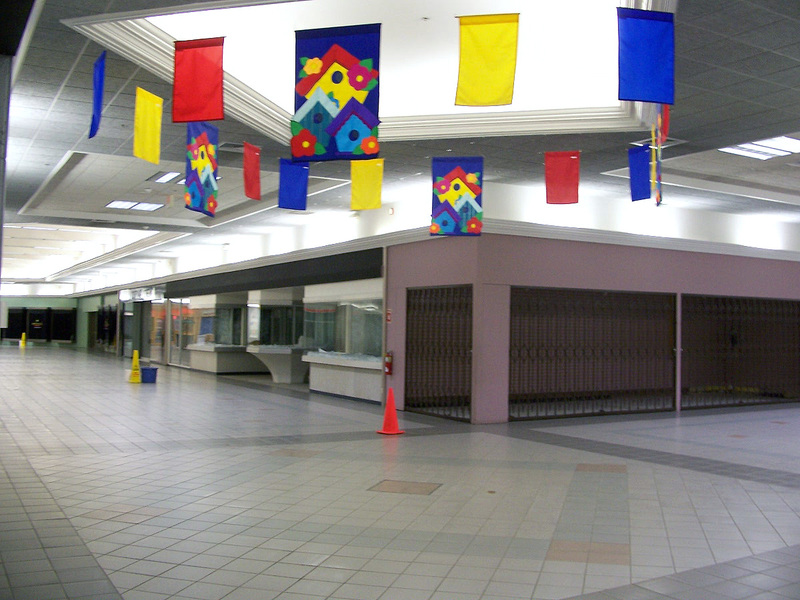 I have no photos of this old place, and it’s near the top of my “want” list, so if you have any old New London Mall photos, please let me know! 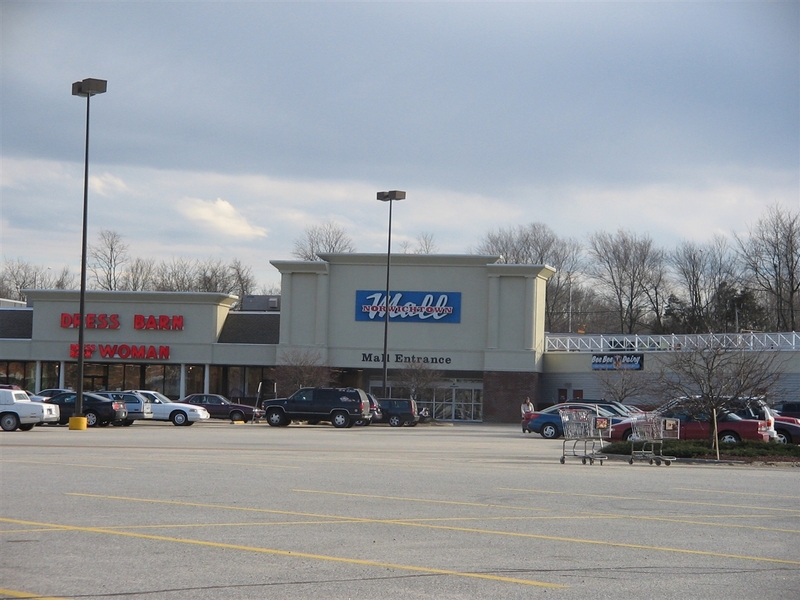 The Norwichtown Mall, its northern cousin, was slightly smaller and slightly younger, with Caldor, Stop & Shop, and local department store Styles as its initial anchor stores. Styles was a smaller anchor that nonetheless was pitched as a somewhat high-fashion chain in line with G. Fox and Filene’s. I’m not exactly sure when they departed, but they were the first of the three anchors to shut. 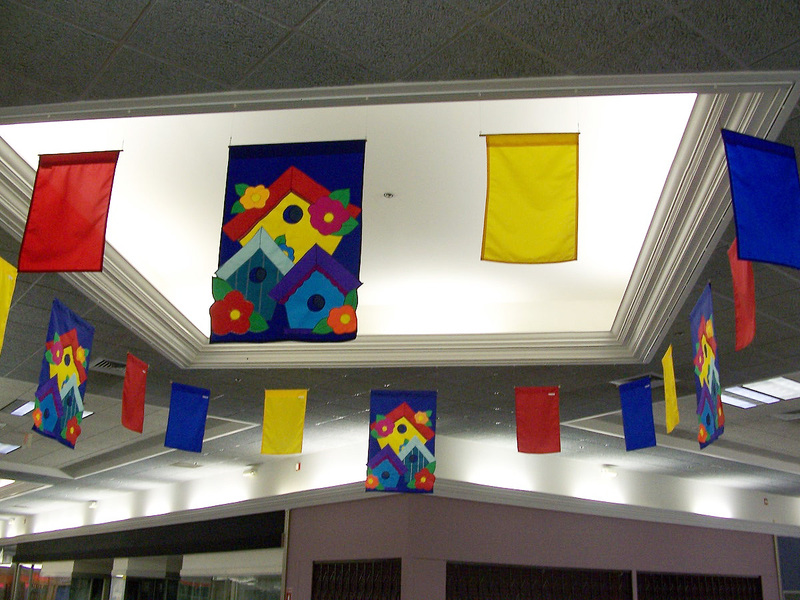 In the mid-late 1990s, Stop & Shop modernized and expanded their store, eating some of the former mall space. At the same time, much of the mall was given a renovation and modernization. Not long after this was my own first trek to the Norwichtown Mall, in summer 1998. 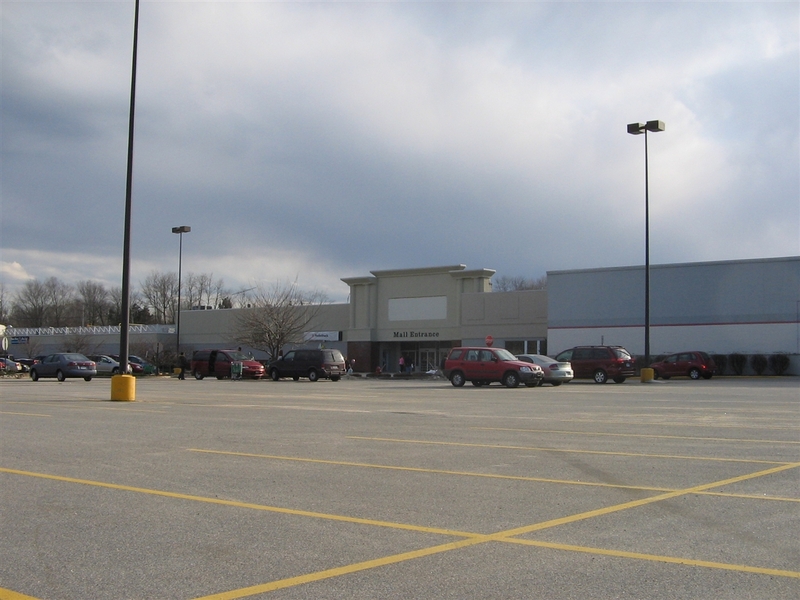 At the time, Caldor was still open, and the mall did surprisingly well for a mall of its size, and was tenanted with a diverse roster of tenants that would be appropriate for the kind of community-oriented shopping mall that would be anchored by a discounter (Caldor) and supermarket (Stop & Shop). There was a Waldenbooks, Hallmark, Radio Shack, an independent record store named University Music, and Bee Bee Dairy, a popular local creamery. Unfortunately, Norwichtown Mall would not last long in this incarnation. Caldor went out of business in 1999, closing all of their stores, and several years later the space was occupied by a Bob’s Discount Furniture store, although they did little to drive traffic to the mall. 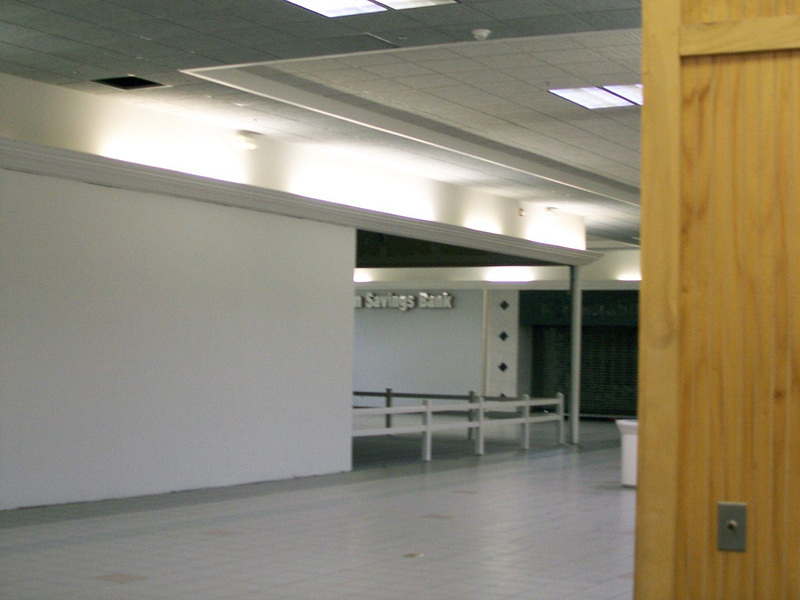 Since Stop & Shop lacked mall access, there was not really a major reason to enter the mall, and tenants very slowly bled out of the mall until 2007, when Bob’s Furniture also left for a larger, newer store in East Lyme, leaving the interior of the mall barren and empty. During this time, a large big box center also opened in Griswold, just to the north of Norwich, siphoning off retail traffic from that side of the city and wedging Norwichtown between several more successful retail areas. Today, little remains beyond Dollar Tree, Radio Shack, a bank, and several other small stores. There have been some rumors of big plans for the mall, with names like Target and Christmas Tree Shops being circulated, though presumably almost any plan to come along will (sadly) include disenclosure of the small and outdated (if still immaculate) center. The Caldor Rainbow also took a trip to Norwichtown Mall last fall, and if you look at their set of photos in comparison to ours, you’ll note how much the place seems to have gone downhill in just a few short months. Our pictures are a little over a month old. UPDATED 4/12/2009: Labelscar reader Bryan sent us these updated 2009 photos of the Norwichtown Mall, with a note that our old photos looked a bit “livelier” than the mall today. Seems hard to believe, but sheesh–look for yourself! The place is more desolate than ever. 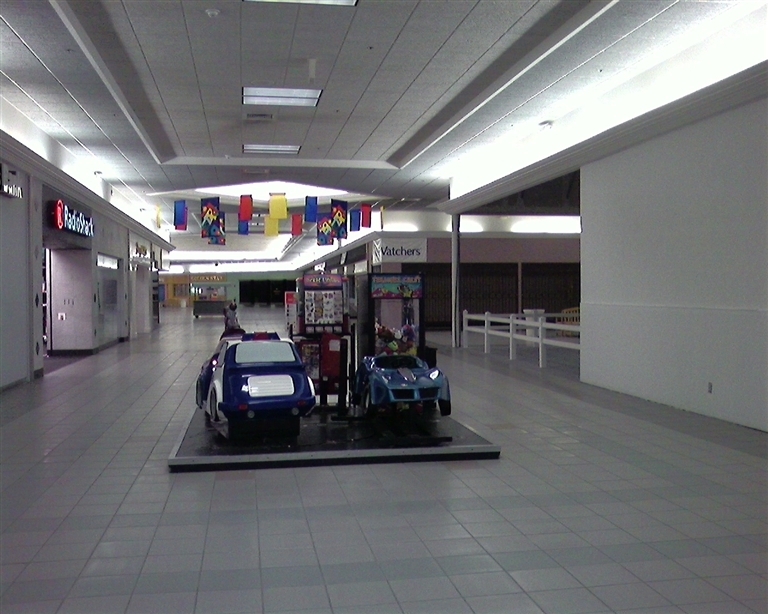 Wow what a desolate mall. I think the main reason why this mall failed is not because of it’s size, but because of the loss of jobs in the Norwich;New London area. If there were still some jobs there then I’d bet that Norichtown could at least be a discount mall. Oh well. Do you know if any mall with a Starbucks as ever died? I think that maybe Starbucks is a good antidote for Burlington Coat Factory. Colorado Mills in Lakewood, Colorado has 2 starbucks (one in SuperTarget, one in the mall corridor), and a Burlington Coat Factory. It’s not doing amazingly well, but they are taking advantage of the new light rail nearby to build up the outlots and also are bringing in H&M and Forever 21. Not that I can think of, but then again, I believe that Starbucks wouldn’t even bother setting up in a tiny local mall, unless the town itself is well-to-do. Plus the blue-collar crowd usually prefers Dunkin’ Donuts. I would think that a DD would do much better in a mall like Norwichtown. Bailey’s Crossroads in Alexandria, Virginia has both a Burlington Coat Factory and a Starbucks. The Burlington Coat Factory there is older than the Starbucks and both are doing ok. Bailey”s Crossroads is actually a complex of shopping strips rather than a mall. So, maybe both can thrive in a strip but not a mall. The Skyline Mall across the street is pretty much dead. It was an underground mall, the worst kind. 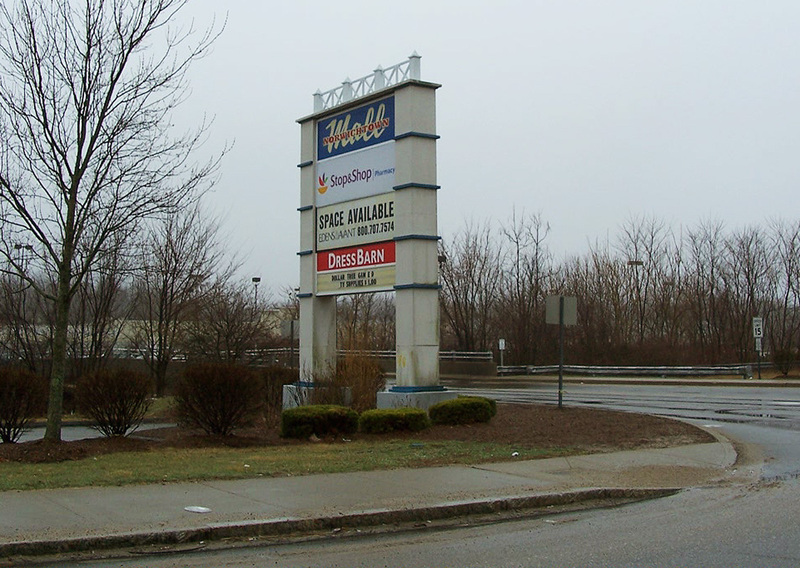 The New London Mall on the north side of Frontage Road had originally in the Marshall’s space a branch of The Edward Malley Company of New Haven. Once privately owned, it was merged with The Outlet Company of Providence, RI in the late 1970’s and closed shortly aftewards around 1983. I don’t recall a Sage-Allen branch in New London, the closest I believe was in Old Saybrook. That’s a surely interesting combination of stores to have at a shopping center(S’bux + BCF), if I ever heard so! 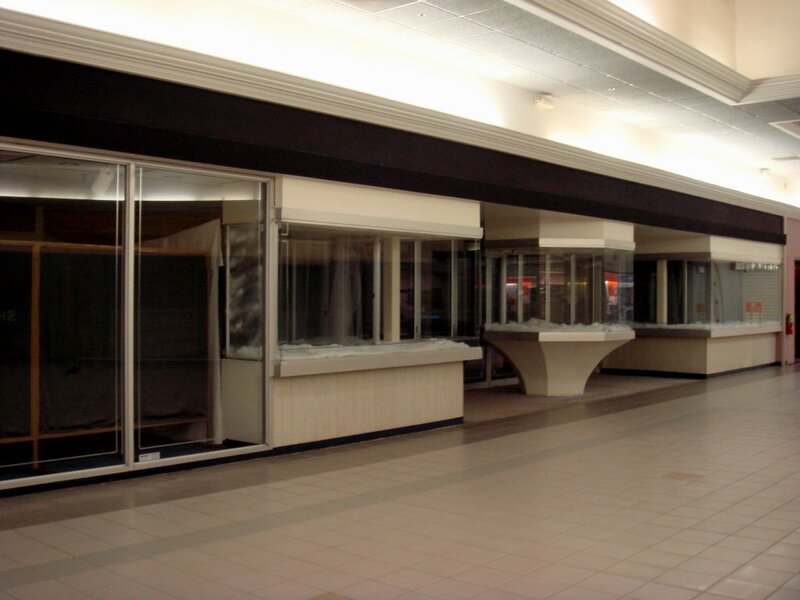 Anyway, it’s sad to hear this mall lost a lot of businesses in such a short amount of time(and also interesting that this mall’s demise wasn’t b/c of certain factors that I’ve often heard have supposedly done in malls, i.e. a mall developing a ‘crime’ reputation + scaring certain customers away(a la Dixie Square Mall of Harvey, IL, etc…), and so forth). What kind of interior shape are the mall’s corridors/hallways in? Are they in an H shape, or something else like that? Just asking, since there aren’t any pics of the directory of this mall. It’s too bad that I probably sense that Norwichtown will probably just be turned into another ordinary strip center and/or ‘lifestyled’, and will just be reconfigured somehow(say, in the area’s where the mall’s interior corridors currently are). You can get some sense of the floorplan if you check the link to the aerial view. Really, it’s nothing special; basically it’s just a straightforward dumbell-style mall with a small side wing that doesn’t lead anyplace (literally). 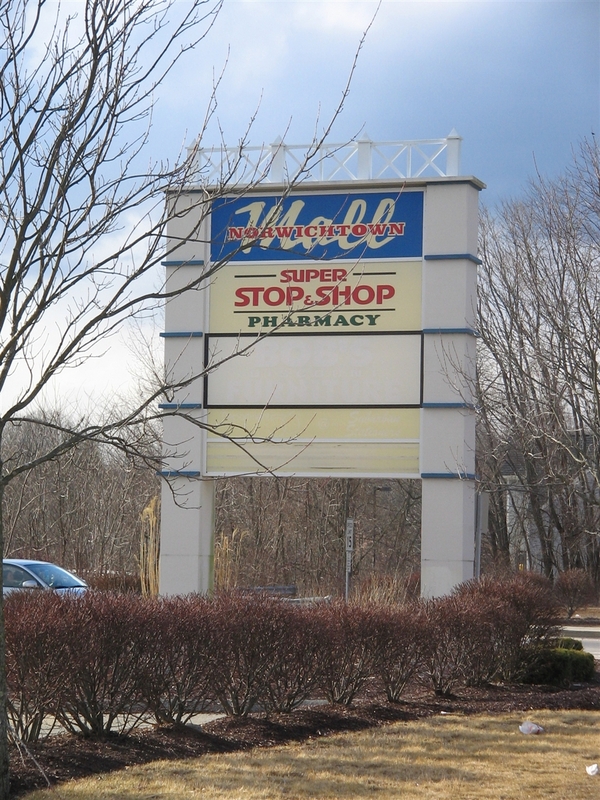 Since Stop & Shop doesn’t have mall access, it’s not even much of a dumbell; the former Caldor/Bob’s Discount Furniture space is the only anchor that even has access into the mall, and the other end finishes by Fashion Bug, where it turns and exits to the parking lot. the new london mall’s other anchor was a Two Guys’s Dept store and later became a Bradlees (#837) when the first ever Bradlees (#880) relocated from across the highway in 1982. If you’re registered with Storetrax, they have an (outdated) lease plan there too. Oh yeah, the mall opened in 1966, per Storetrax. Nice piece here. Some have chimed in providing history and background on my site. On a related note, New London Mall seems to be a hot ticket around here. Would’ve loved to see what it looked like before the bland lifestyle homogeny seeing as I’ve never been past Crystal Mall out that way. 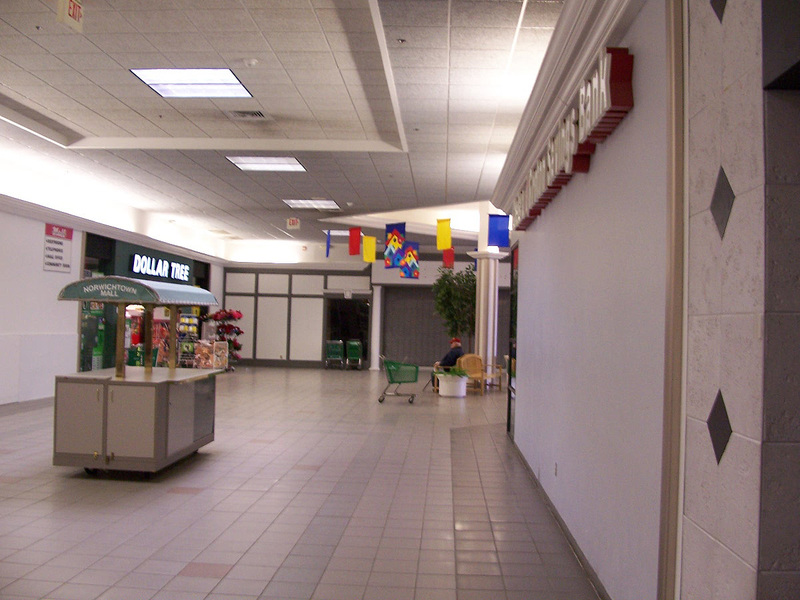 One of the most fascinating indoor malls by far in the state was Farmington Valley Mall; which had it’s own de-malling around the metamorphasis of New London Mall. As I try to surface how much value that mall has today in memory realistically and even as far back as a child I knew then that Farmington Valley Mall just really sucked. It, unlike some other of these indoor malls, staggered for a long time and surely throughout my lifetime. I have a feeling that sign was used before as a General Cinemas sign,notice the odd boxy shape it has and how each part is segmented evenly. Also look at the bottom of it where it has the yellow strips that look like they could have been used to put removable letters on. It might’ve had a movie theater at one point,probably I would guess a small 2 screened one that didn’t last very long (it was popular back then to have movie theaters inside malls, for example Naugatuck Valley Mall (now long gone) which this mall pre-dates by one year had a General Cinemas movie theater in it at one time,decades before it’s theater was moved to the outside of the mall and was replaced by Holiday Cinemas. about the Farmington Valley Mall,it had that strange logo with the brown-red-orange-yellow rainbow on top and the horse and buggy on the bottom correct? If I remember correctly that mall had a mini train ride inside near the center during Chirstmas time. It also had the best Walgreens that I had seen by far. There was a chain in the FVM called Three D Bed & Bath does anyone remember what it looked like? All I could remember is it being a warehouse-type furniture clearance store. Taking a look at picture 16 that display case looks like it was a ticket booth,notice the half octagon shape that is all glass it seems large enough for a person to stand behind it,means that weight watchers might have been a movie theater at one time. also notice the discoloration on the floor there, it looks as if the booth was reconfigured to a display case and the original walls of the booth were removed in favor of the current bottom design it has now,but they didn’t bother to repaint the floor. Actually, I remember this mall very well…grew up shopping here…this case once held jewelry…it belonged to a jewelry store and they used to fill up the case with beautiful displays. This mall was never a movie theater, nor did it house one. My error if it was built in 1966 that means it’s THREE more years older than the Naugatuck Valley Mall built in 1969,coincidentally that mall ALSO had a G.Fox and had a dumbell floor plan. This mall must’ve had a movie theater just take a look that this picture of the same area from a different angle. my guess would be that the left and right walls were additional ticket booths and the wall to the left used to display large movie posters,notice how the windows go from the floor almost to the ceiling,they’re large enough to have a movie posters on them, my guess is the marquee was mounted high above the ticket booth,and my guess it was considerably large since the top wall of the front of this vacant tenant painted back is longer than any other usual store front in a mall such as this. It would be a safe guess this movie theater closed way before the renovation since it does not look like a marquee could fit there with the white cornice piece there. 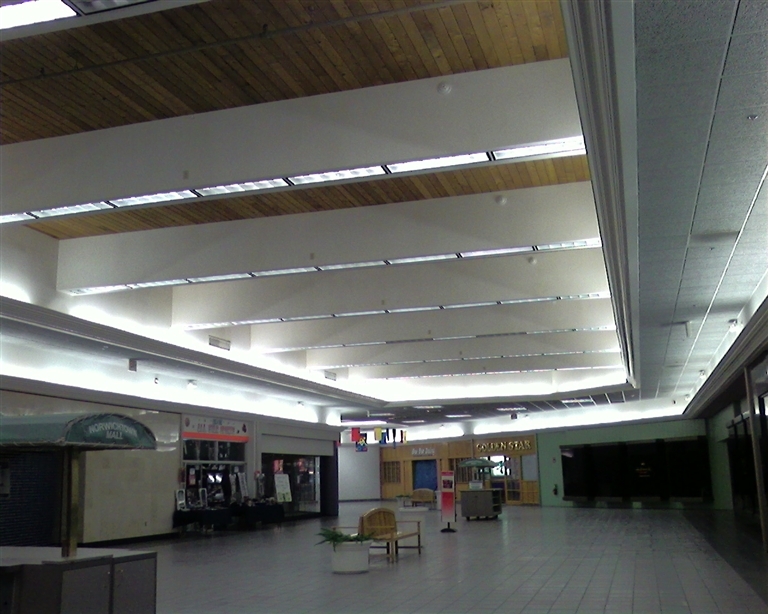 There must have been a roof or wall structure that has been removed in the renovation because in many pictures of older malls,there is usually some sort of structure above the stores that isn’t a setback blank wall. My guess is that it had those odd roof overhang structures over each store or something to that extent. There’s never been a movie theater inside the Norwichtown Mall. That octagonal structure was a display case for a jewelry store. It’s only 4 feet in diameter. This mall never had a movie theater. I have lived here all my life and there has never been one. I am trying to see if I have any pic of me and friends hanging out at the Norwichtown mall as a child in my early teens. Hmmmm…I will keep you all posted. Mark, not to digress from Norwichtown but you seem to have remembered the Farmington Valley Mall sign well. I do remember its “Caldor” rainbow-styled colors above the horse and buggy thing. I believe the mall was officially called “The Shoppes at Farmington Valley Mall” (not to be confused with the “lifestyle” homogeny down the road a bit). About a movie theater at Norwichtown; good observation but I’m pretty sure this was always a department store. It’s unsubstantiated by myself but I don’t remember any mention of one by those I’ve asked (including Fox N Allen, another poster here). Not to get too speculative but it could’ve been one seeing as they were commonplace in those smaller indoor malls of that time. 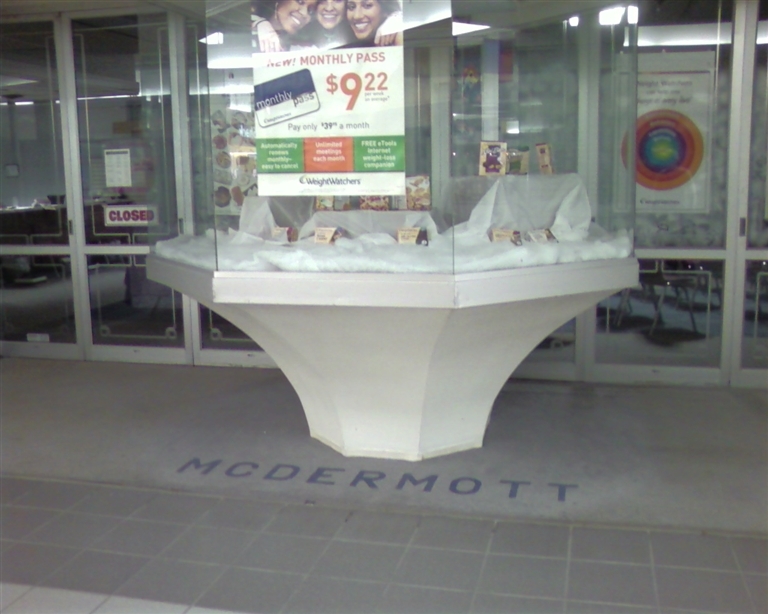 I’ve just found out that spot was McDermott’s a jewelery store. Someone has a hard time excepting there wrong i guess. There was NEVER a theater in the Norwichtown Mall! I don’t care what the display case looks like, there simply was no theater period. I remember the mall since it opened, i met my wife there, i have pictures of me at age 5 on Santa’s lap when Grants was there, and my children were pictured there when they came along. I loved that mall, and i miss it!! Just talked to my Dad who has always lived in Norwich. 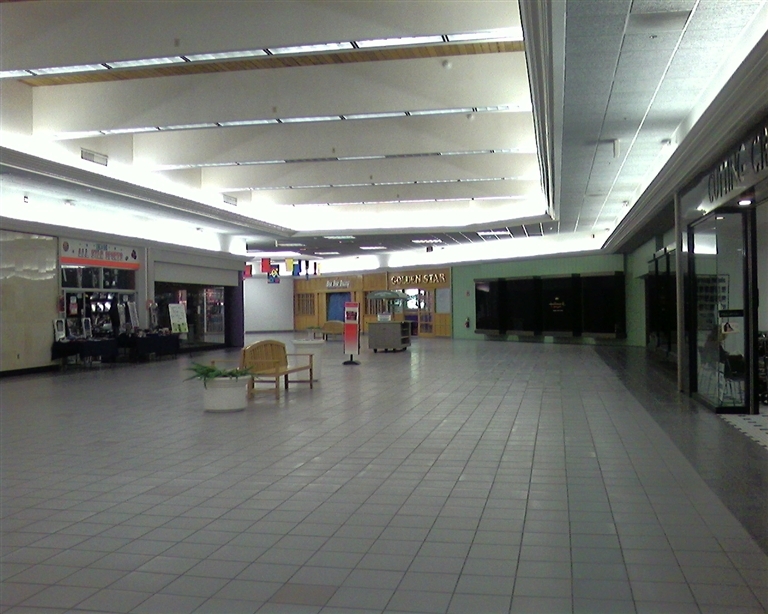 Never any movie theater at the Norwichtown Mall. The closed down arcade used to be called Tons of Fun and in the mid 70’s was filled with pre video age games (such as pinball) and a motorized game with a helicopter and pop up monsters that you shot down. The original tenant of the Caldors/Bob’s store was a W.T. Grant’s or Grants Department store. The entrance was on the side of building (north wall) of Caldor’s/Bob’s. It was the full length of the side with archways and entry doors/windows. They moved the entrance to where it is now after Grants left and Caldor opened. Grant’s did auto service and/or tires. Garage doors on western side of building(back) still are there today. Some longtime, historic Norwich companies had stores in the mall when they moved from Downtown. H.A. Bruckner’s (men’s), Shetucket Harness(outfitters), Suburban Stationers, are just a couple. 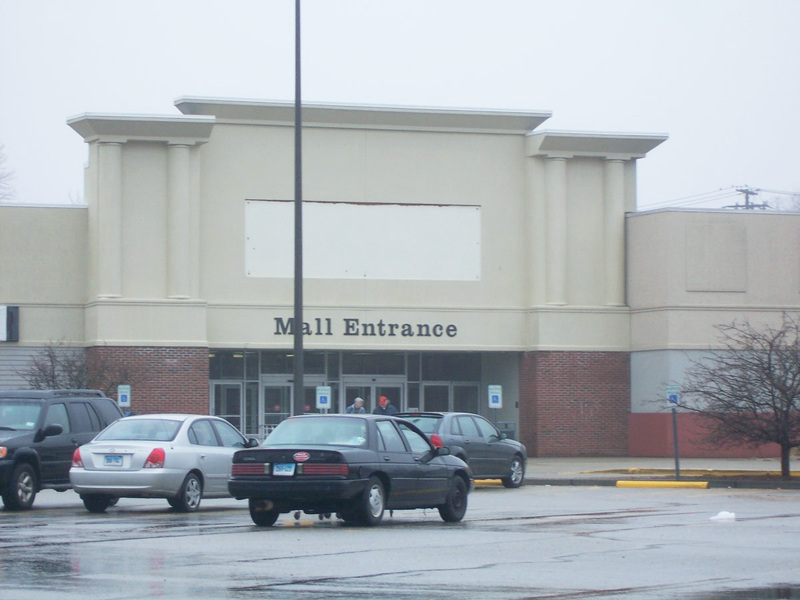 Most of us actually would travel to the Auburn Mall in Auburn, MA before Crystal Mall came to be. Great posts about the Norwichtown Mall. In the early 80’s my mom was the Marketing Manager for the Mall and I spent a LOT of time there as a kid. As a matter of fact, my Dad built the interior fixtures for the pet store “Puppy Love” that was in the small wing of the Mall, across from Styles. I have very good memories of that mall. Kissing my 7th grade girlfriend just outside of the arcade “tons of Fun, shopping at “Tech Hi-Fi” where I bought my first high end cassette deck and buying 45s from Caldor. I think my Mom still has old photos of the mall at her house. I’ll ask about them next time I’m home. WT Grants moved from downtown Norwich to the mall and as Kevind indicated above was the anchor prior to Caldors. Anyone remember the Amber Romm, a ladies hairdressing salon done in all reds? McDermott was an original, a fixture in the area, and never a movie theater there. I bought all my clothes at Bruckners, and the other large store was Vernon Drug. And yes, TwoGuys was the anchor at the far end of the NL mall, and right outside Two Guys was a Nathans Hot Dog stand and an Orange Juilius! !Thanks for the memories. @BIg Mike, Two Guys auto center still stands as Monroe. When I was a kid in the 60’s and 70’s all auto related stuff was sold in that building and auto repair was done. The white brick facade matched the bigger store located at the rear of the building. Two Guy’s featured it’s own amusement area and indoor restaurant, but I never remember the restaurant being open. do you mean Picadeli Pub? A few friends and I stumbled upon this site as we grew up in Norwich and frequented the Norwichtown mall as kids in the 1980s. I worked in Burr’s (card & gift store) for a few months while in college in 1991. Burr’s was named after the owner, Mr. Burr (first name escapes me). He set up a yellow carousel-themed candy shop outside the storefront called, “Nancy’s Carousel”, named after his daughter. A few years later Mr. Burr sold Burr’s to Suburban Stationers. By 1991, Styles had already closed and some stores (including Burr’s and Tons of Fun arcade) were using the Style’s space for storage. 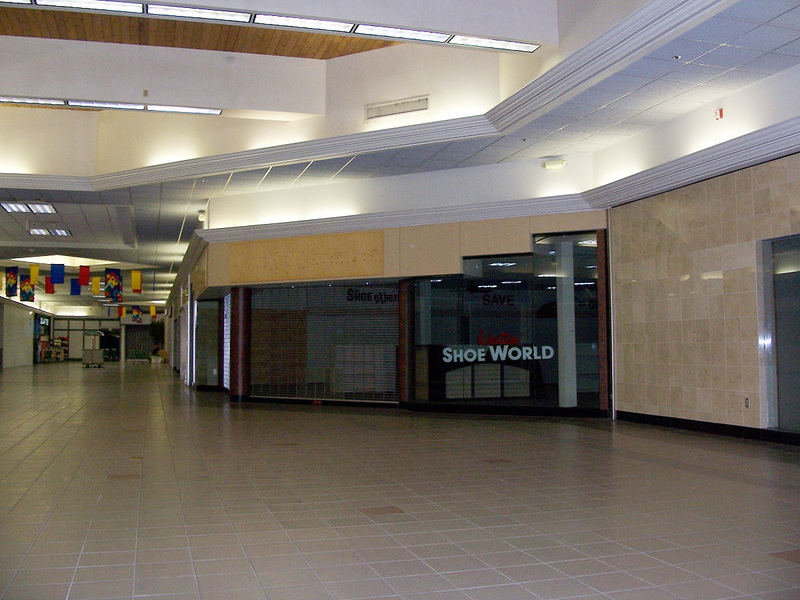 Already the mall was on it’s way to the doldrums in 1991 as there were a few vacant stores. H.A. Bruckner (suits & business attire) was still in business then; the owner was a former long time employee of H.A. Bruckner who purchased it from the previous owner. H.A. Bruckner closed a couple of years later, I believe. I asked someone why it was closing and they said, “Norwich businessmen want custom fit at a cheaper price!” 🙂 At any rate, if you ever get a chance to see older pictures of H.A. Bruckner when it was downtown (see William Stanley’s books) it was quite the store. McDermott’s was never a movie theater. You couldn’t even fit a movie screen in there if you wanted to. It was always a jewelry store for as far back as I can remember (1970s). The only movie theaters in Norwich in the 70s and 80s were the Lord Cinema and Palace Twin in downtown and Cinema 1&2 in the Ames plaza by I-395. Nancy’s Carousel wasn’t the only “in the hallway” store… Kaplan Travel had a brown, cedar sided (I think) office as well. My friends and I frequented Tons of Fun arcade in the 80s. There was Dragon’s Lair, Star Wars, Gauntlet, Tron, Track N Field, as well as a Sinistar sit-down cockpit. And yes, there were some pinballs as well as crane games there. Before Stop and Shop expanded, Vernon Drug and Bee Bee Dairy used to be located there. Then, Vernon Drug closed its doors forever and Bee-Bee’s moved inside the mall. Bee-Bee’s was bought by Newport Creamery and then sold to become Bee-Bee’s again. I heard that Bee-Bee’s closed recently when it’s lease was up. Next to H.A. Bruckner’s was Debutante, a women’s clothing store. My childhood memories from being dragged in there by my mom include fluorescent yellow walls and orange/green carpet (no doubt 70s decor) and these huge plastic hands in the store front. As mentioned in earlier posts, recently there was Bob’s Furniture, then before that Caldor (or, as us Norwich folk called it, “Caldors”). Then, before that, Grant’s, where my aunt worked. My brother still has an old, tiny, artificial Christmas tree that was given to us from my aunt. It still has the Grant’s sticker price tag on the bottom. Caldors was great in the 80s… in the store, I remember a small, square area with a counter. This counter area had cubbyholes for all the 45s. On the front of the counter was a paper sheet with the 45s for sale along with a number designation for ordering. Caldors was the first place I got to play with musical keyboards, ColecoVision, Odessey2, Atari, and the venerable Commodore 64. The electronics were in the back of the store… the first place I’d drag my parents to if we had to go shoe or clothes shopping for school. Next to Puppy Love (pets) and Tons of Fun was Two Legs (jeans)… maybe Puppy Love took over the Two Legs space, I am not sure. Other people will have to comment. There was no Orange Julius like the New London Mall… a big disappointment for a kid in the 80s! That’s about all I can remember… I’m enjoying other people’s memories. I hope to see more. If you want to get a taste of what it was like back in the 70s and 80s, just go to Benny’s across the street. Benny’s is still alive and well all these years. Every time I go in there, it’s like a trip back in time. @Tony, I was manager of the old Bee Bees for about 8 years. I was told that the building which housed styles, piccadilly, Puppy Luv, Radio Shack and the bank was the ooriginal WT Grant. The Mall offices and bathrooms were left over from this previous use. Just like the sister site in Old Saybrook, the former Grant store became divided up and the bigger Grant City complete with Bradford House Restaurant opened in a new building next door…In Norwich this soon became Caldor as in Old Saybrook. Yes, that Benny’s was one of the largest in the entire eastern region of Connecticut. How many bikes did I receive from there? Dunno. At one time the traffic just in and out of Benny’s lot was tremendous. I remember double lines of traffic either entering or leaving Benny’s at anytime. Every parking spot was taken. The store was (and still is) always well and brightly lit and clean. Does anyone remember Benny’s when it was still in downtown Norwich? Sears? Beit Bros.? Mr. Big on 8th Street? Big A on Norwich Ave.? Those were the days. 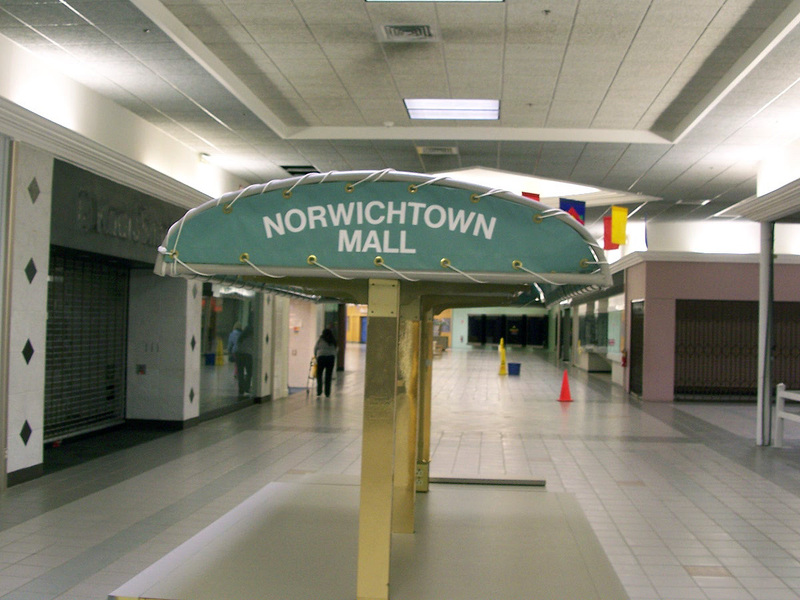 As of 26 January ’08 it is reported in the local newspaper that one of Norwichtown Mall’s few remaining tenants is closing or has closed. Radio Shack. I am 21 years old and I have grown up in Norwich. My mother worked at Styles. I remember when Caldor’s flourished and when I begged to go to PUppy Love. The arcade was great and there was a candy store set up right in the middle of the ball. Here, you could get candy by the pound (gummy’s, chocolate raisins, malt balls etc.) There was a shoe store, Mcdermot jewelers, the arcade was great! Walden books, radio shack, bee bee dairy, a sports store and a few other shops. It’s sad how the mall has just deteriorated. Unfortunately, while I like the idea of a Target going in the mall, a lot of the surrounding residents will fight it because it is such a suburban family area. There already is SO much traffic because of the casinos and the roads aren’t really conditioned for another attraction such as a Target. It’s unfortunate, though I understand that Dress Barn is doing really well! Also, Golden Star has some of the best Chinese food in the area! Golden Star, Weight Watchrs and Cutting Crew are gone from norwich now too…mostly because of the refusal of management to sign more that 6 month leases…nothing now but a family dollar store…too bad…I remember Grants and later Caldor and Styles and the Booksmith/Musicsmith that was replaced by Walden books later. The music store and the arcade were popular too. It’s a shame. I LOVED THE NORWICHTOWN MALL MY GIRLFRIEND AND I USED TO WALK THERE AFTER SCHOOL WE HAD A GREAT TIME WE DID ALL OUR CHRISTMAS SHOPPING THERE WE ALSO HAD OUR PIC TAKEN WITH SANTA WHICH I STILL HAVE AND PUT OUT EVERY YEAR .. I ALSO USED TO GO TO THE MALL WITH MY MOTHER WHEN SHE WOULD GET HER HAIR DONE AT THE AMBER ROOM GINNY WOULD DO HER HAIR I WOULD WALK AROUND THE MALL THEN LATER WE WOULD EAT AT THE BRADFORD ROOM AT GRANTS WE HAD SO MUCH FUN .. MY MOTHER IS NOW GONE BUT I DO CHERISH THE MEMORIES I LOVED THAT MALL….WHAT MEMORIES….DOES ANYONE REMEMBER MR. BIGS IF YOU DID GO THERE YOU NEVER TOLD ANYONE …..THEY WOULD LAUGH AT YOU…. I remember crowding around those video games when Dragon’s Lair got installed at Tons of Fun! Also located outside of Caldor was a greenhouse looking store that had stickers and such. What was it called? Another store in the center aisle down near Burrs was the a sports store– Sports Shack?, which became a tenant in a regular storefront later. At one point in time, a Treats Bakery walkup counter was also was located across from Styles for a little while. I also remember a waterbed store too… I remember Fayva shoe store being down near Debutante there at some point too. 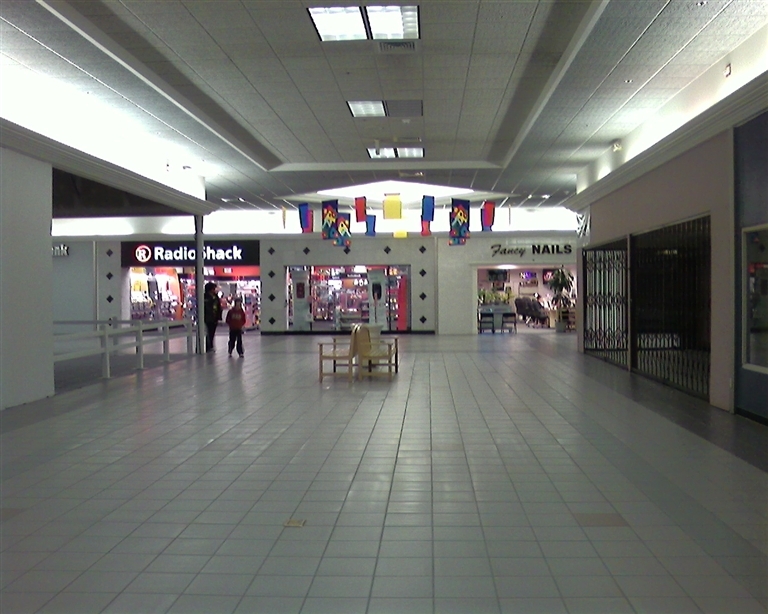 Only stores in the mall are Stop and Shop, Dress Barn, Gold Star, GNC, Dollar Store, and a nail salon. Dress Barn has its gate ALWAYS down to the mall, they basically turned their back to it even though they probably thought when they opened that this entrance would be quite beneficial to draw mall traffic, now what traffic? I live near Kansas City right now but grew up in Norwich during 70’s and 80’s. I even used to work for Foxwoods in the 90’s. The things I remember with the mall is the restaurant called Piccadelis (something like that spelling) that someone asked about. And also the flood that had ruined a lot of Stop & Shop’s parking area. I been back to SE Ct about 6 years ago and they had just finished the stores where the New London Mall used to be and I have to say it is an improvement and maybe that is what is needed for the Norwich town mall area. Across the street from the Norwich town mall there was a bank and shopping area, is it still there? I hope to come back to Ct a year from now to see relatives and always look forward driving thru Norwich. Also I understand Bill Stanley has more books out beside, Once Upon A Time, which my mom has here in Ks with us but I was hoping for a book that includes1960’s thru 1980’s items. Does he have one like that? Dos anyone know where I can find on the internet info about Troy laundry which I know is gone but just like to find history about it. Thanks! Id give my right leg to have one more beer at the Pickadilly Pub. I’ll be brief, because I’m not even sure this will be seen in an entry this old. The New London Mall was awesome; I went there 3-4 times a month for probably 10 years when I was a kid (we went the back way, natch) and I can see virtually every corner of that place in my mind’s eye. I do not think Sage-Allen was an anchor, but I’ll ask my mother. I’ll look through some old photos, but I don’t recall having any of the Mall. It might be worthwhile to check The New London Day archives. I checked out the “new place” 7 or 8 years ago and it was crap. @Variety House, Original Stores in New London Mall that I remember… The Outlet (later Malley), Two Guy’s, D&L(Woman’s department store), Loft Candy, Kay Jewelry, Kaplan Travel (in kiosk first than former Loft), London Luggage, Tarney’s Men Store, Fifth Avenue Card, paperback Booksmith, Hickory Farms, Orange Julius, (This side still standing as is 1/2 Outlet), other side..Thom McAnn, Mall Coffee Shop, CVS (no pharmacy then), Castro Convertibles, Singer, and Taj.Can’t remember if there was another 1 or two. Also there was a tobbacco stand and the can do shoppe in the middle of the mall with Kaplans. D’oh! I missed that comment up top about Edward Malley’s…that sound right, actually. Gotta check that out. I spent a lot of time in both malls from the late ’60s through the late ’80s. The Norwichtown Mall had a great bookstore with a teddy bear on a swing suspended from the ceiling, that my son loved. The anchor store at the New London Mall around 1969 was called The Outlet Company, a department store. Angel – yes! This has tortured me for a good while. My mother used to drop the “company” part and just called it “The Outlet”. I was born in Norwich and lived there on and off for about 12 years. I remember some things about this mall that weren’t mentioned: There used to be a huge merry-go-round in the middle of the mall, near the Walden Books. Well, it looked like a merry-go-round and was lit up like one — oranges, yellows, reds pinstripe top, big bulb lights, etc. — but really it was a huge candy thing. There were displays on all sides. There was also a rather large arcade. If you entered the mall by Caldor, and walked down toward walden books, then you hung a right and in that wing, on the right side, was the arcade. It was 1 and 1/2 levels. Had all the usual. Ski ball, racing car games, etc. My father & I went there a few times when I was in third grade (roughly 93/94). My mother worked at Bee Bee Dairy as a teen as a waitress and a cook. They used to be rather popular, yeah? And there was a jewelry store at the corner across from Walden books. I got my ears pierced there in 3rd grade, too. I don’t remember the names of any of the places I just described, though, and I don’t have any pictures. I wish I did. They’re still vibrant in my mind. It’d be neat to see it again. I just remembered, the name of the restaurant in the Norwichtown mall was the Pic-a-deli Pub. It was of the dark and seedy genre of the era, a great place to get loaded anonymously. I worked for University Music for many years. I started there when the mall was still a thriving retail hub, and watched as it went – quite rapidly, in retrospect – down the tubes. I was probably quite surly to more than one of you about your music tastes back in the day – but then, that’s how indie music store employees are supposed to act, I guess. See: “Hi Fidelity” – that’s about as accurate a representation of music store life as has been written. 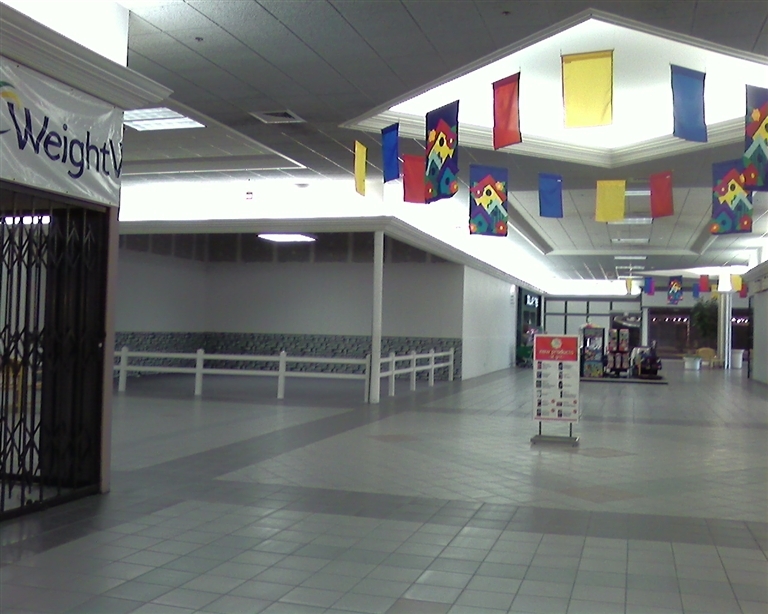 Our store was down in the “Tons of Fun” wing, which would be picture norwichtown-mall-10.jpg above. TOF was at the end of the hall on the right. Across from them, to the left of the emergency exits, was Puppy Love, the pet store. The space in between PL and the GNC went through a series of different stores. Two Legs was back there for some time, and later a t-shirt shop that made custom Ts. I don’t remember the name of it, just that there were a couple of cute girls who worked there that we’d go flirt with. University Music was in the spot with the wood-grain front on the left. The spot in front of that was an optician’s store… anyone remember the name? I don’t. It wasn’t a big chain a la Lenscrafters or anything. All I remember is we’d get high with the two opticians out back by the dumpster. Which is maybe why I can’t remember much else about the place! In front of them, in the corner spot which you can kind of see in norwichtown-mall-09.jpg (where the Weight Watchers store is) was a little jewelry shop called Dazzle. Same owner as McDermott’s, Dazzle was geared more towards the younger / mallrat demographic. Again, mostly notable for the cute girls who worked there. Most of whom were too young for us to take to the Pic-a-Deli (spelling is lost to history, but I think that’s what it was) for drinks after work. When I started working there… in the late 80s / early 90s, the mall was pretty thriving. Even with the “fancy” Crystal Mall in Waterford pulling away business, we did pretty well. Most of the stores in Norwichtown were Mom & Pops, which I think the locals liked. Caldors was doing well, the new Stop & Shop was bringing people in. The downfall of the mall, honestly, fell squarely on the shoulders of mall management. As I recall, the first casualty was Styles, a women’s clothing store across the hall from us. I don’t know the reason they closed, but I know what happened after – the space stayed empty. Forever. A giant ugly wall was erected in front of Styles’ former facade, and remained there. Some kind of construction was going on behind it – we could hear it through the wall, noisy and distracting. This went on for months… and months… and months… business in our wing of the mall began dropping. It’s hard to visualize now, from the pictures above, but upon entering by Caldor, one could easily get the impression that the WHOLE rear wing of the mall was closed. And so people would venture no further. We’d often have customers wander in, surprised to find we were still there. We complained and complained about the lack of signage, but nothing was ever done. And it didn’t appear that any effort was being put into wooing new stores to take over the Styles space. 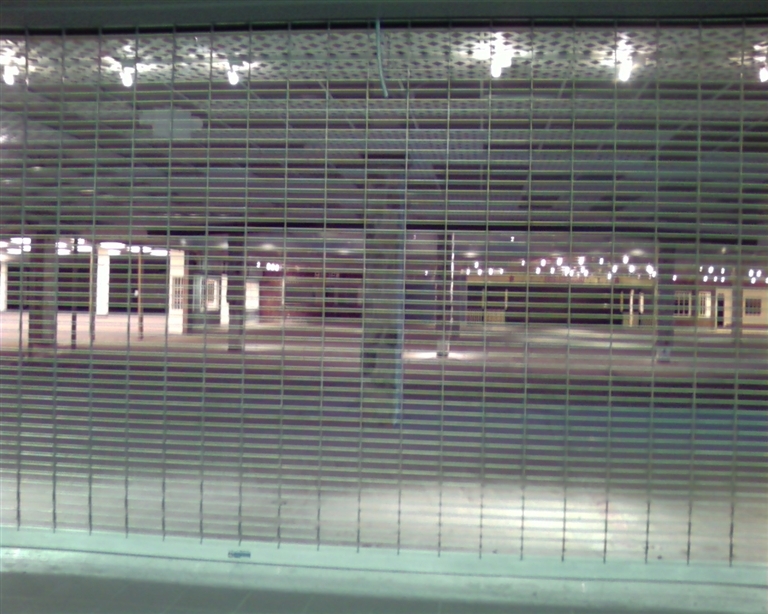 As I recall, one of the mall entrances was also closed off for a time due to some construction. That didn’t help matters much. Tons of Fun, like many arcades, went under with the boom in home game systems. At that point, that whole side of our wing was dead. I left in the early to mid 90s, as I recall many of us were on our last legs, due to the simple lack of foot traffic. I went back to the mall in the early 00s for some reason – I was back in town visiting my folks or something – and remember being shocked at how far it had fallen. It was desolate. The S&S and Bob’s seemed to be fine, but everything in between was like the walking dead. No customers, maybe a couple “mall-walkers” was all. Most of the storefronts had been shuttered at that point. My suspicion is that mall management has been not renewing leases – or intentionally offering bad leases that no one would sign – with the intent of getting everyone out. A completely empty space is easier to attract a big anchor to than one with that last vestiges of the past still clinging to it. That way a Target or Wal-Mart or Costco can come in and have the space tabula rasa, do what they will with it. This is obviously very old, but Seth, if you read this, would love to hear from you! My family owned University Music. Let’s see…maybe I can fill in some more of the blanks. The water bed store was called “Water and Air”. The bookstore was the “Paperback Booksmith”. the optician was Russo Opticians. I grew up in Norwich in the 70s and 80s and even as a little kid the Mall seemed a little…OFF to me. The ceilings were too low, the huge globular lighting fixtures they had gave off almost no light, the wooden benches wouldn’t have been out of place in some of the more desolate subway stations in New York. There was altogether too much brown and yellow – even apart from Caldor – as if the whole Mall had a bad case of smokers’ mouth. Chintzy? Yeah. And blazingly second rate. With all the charm and aesthetic appeal of a high-end supermax. But what made it really special was that faint note of menace that permeated everything. I don’t know how many rapes or murders occurred there but it was the kind of place where those kind of things SHOULD have happened. No, it wasn’t a acid trip, exactly, but it sure was the day after one, when you’re down but everything still seethes and quivers and seems to be and alive and out to get you. Needless to say, I spent many, many formative hours there. I’m 38 now and my mother still likes to tell the story of how I threw a seismic temper tantrum in Bee Bee’s when I was four or five because we didn’t get a seat where I could see the short order cook. Another time I was in the arcade with my dad – this was before video games, when it was full of pinball machines and that helicopter vs. monsters game PhilW mentioned (check it out: http://marvin3m.com/arcade/chopper.htm) – and I became convinced that some kid had stolen my knitted hat, and followed him out yelling at him to give it back. Somehow, I don’t know how, it didn’t end in tragedy. Later on I started to haunt the Paperback Booksmith. Loved that place. I bought my first copy of Beethoven’s 9th Symphony there and read all of “2010: Odyssey Two” (the sequel to “2001”) without buying it. (I was a strange kid.) I also spent a lot of time going through the classical music LPs in Caldor – they had a surprisingly excellent selection for a discount department store in a nowhere town. And I played a lot of Tempest and Star Wars and video baseball at Tons of Fun. I remember they didn’t take quarters, only tokens – but they didn’t give out four for a dollar. I don’t remember if it was more or less, though; probably less. I got one of my first summer jobs at Stop&Shop, back before it was super. I started out bagging but my real calling was in carriage collection. I’d go out in the parking lot for hours and hours and gather up ten, twenty, thirty carriages all in a row and push them up to the holding area. One time a whole chain came apart on me and there were carriages everywhere; probably nicked and dented a bunch of cars. Oops. Sometimes my buddy Seth Gordon, who had a bunch to say right up above, would come and hang out. For some reason I especially remember the day he was totally stoked about getting the album “Down to the Moon” by some New Agey musician named Andreas Vollenweider. On my very last day there I was given a pair hip waders and sent down into the creek to drag out a bunch of carriages. Still one of the worst jobs I’ve ever had to do. Eventually, of course, I started stealing. Mostly books by Anton Szandor LaVey and other occult-lite items from the Booksmith (or was it Waldenbooks by then?) and tapes from Caldor. Got all of the Brahms symphonies that way (did I mention I was a weird kid?) but also, at Seth’s insistence, “Dark Side of the Moon.” (The boy knew his prog rock.) But my thieving days were few: I was almost caught once by a couple of seedy guards at Caldor (who I realize now I probably could have sued for insisting I had stuff on me when I was clean) and that put the fear in me. I didn’t get back into it until years later when I got a job at Tower Records in New York. Other fond memories: that Chinese restaurant, which was actually pretty good for fast food; boisterously soliciting donations from passersby for the NFA football team; buying a suit for my high school graduation at Bruckner’s; watching the place get flooded during an epic rain storm in the early 80s; visiting my mother, who worked part-time at Styles for a couple of years, (especially when I needed to hit her up for LP money); drinking the occasional underaged beer at the Pic; horsing around with a friend (who later became Tater the Gator for the Norwich Navigators) at the water fountain at Caldor, accidentally spitting on the woman behind us, having her attack us with her baby carriage and then chase us the length of the Mall. In later years, after I went off to college, my visits usually centered around University Music where, yes, Seth was indeed surely to me. I don’t remember the last time I set foot in the place. From the sad look of it, though, I haven’t been the only one staying away. Hope they do something cool with it but somehow I doubt they will. @CROWE, I probably played games there with you. Tons of Funs actually started with quarters, then changed to 5 for $1 tokens, then 4 for $1. The mall is even worse now. Only a Dollar Tree, GNC store, and Nail salon remain. I’ll see if I can find some older pictures of it, it was a thriving mall that died because a lot of the small businesses girding it either couldn’t compete with the larger chains or were absorbed by them. I remember going to this mall with my mom in the late 60’s.. I thought it was so cool to see stores inside a building.It seemed so big to me at that time. It was my first mall experience. My mom worked at a woman’s clothing store named Emmons, I think it was called. I remember a clothing store that had teen clothing and I wanted a maxi coat, but I didn’t get it. How funny it is to remember some of the little things. My mom would ask me if I would like to go to Bee Bees Dairy for a hot fudge sundae and I was always up for that. My favorite thing to eat there was the Bee Bee blue ribbon burger. It was just a burger with swiss cheese on it. Till this day I love swiss cheese on my burger but it doesn’t taste the same though. I’m 50 yrs old now and I often think back to my childhood with fond memories. The clothes, peace signs, maxi and mini. I remember going to Mr. Bigs to. Does anyone remember a store called Vality?? I live in Idaho now and have been out west since I was 18.One of my goals is to take a trip back there, hook up with some family that I haven’t seen in years and visit the places I have been and lived as a child. @Theresa, Vality had a store in Gales Ferry, CT. If you lived in CT, it used to be in a mall traveling along to Groton. It died early, being replaced by a grocery store and ocean state job lot after a long period of vacancy. My grandmother used to live about 2 miles away from here. I have many fond memories of her taking me to this mall when I visited her. Most of the toys I played with at her house were presents she would buy me from the various stores there. I’m 27 now and like the previous poster I live in Seattle and would love to go back and visit the area again. I’m so glad this site exists to preserve the memory of special places like this that would otherwise be forgotten. Does anyone know anything about a company based in Norwich that sold shotguns under name of Hopkins and Allen Arms Co. I have an old, old, shotgun with this name carved into the wood. I would like to know if anyone who lives there or ir a relative of these men would like to have this gun as I myself do not have a use for it. It is old and used and collapses in two with a pin that screws in to put it back together. Please contact me with info and I thank you. This post made my day. I came across this while searching for any evidence of the giant concrete bee that lived in the play area of Styles in the 70’s and 80’s. Wondering if it was somehow related to the Bee Bee logo. I was born in Norwich in 72 and grew up less than a mile from the Norwichtown Mall, and walked there just to hang out weekends and afternoons. Remember at Christmas when they would install the mechanical displays of elves making toys and Santa’s reindeers? So many memories, from being a little kid and lying that it was my birthday so that I could play with puppies at Puppy Love, to scrolling through the same ‘alternative’ albums at Paperback Booksmith and later University Music. I’m another one who grew up in Norwich and actually worked at the mall. I worked at the health food store – before it became GNC it was called Nature Foods Center – and it was part of a chain. Before it was part of a chain, it was its own store (can’t remember the name). We had a small cafe where we made “healthy junk food” and had a frozen yogurt machine that required slicing up big tubes of frozen yogurt (or gross – frozen tofu) and putting the slices and nuts/fruits/tiger bars into a giant grinder – which would express it as “soft serve” into a cone or cup. I find it funny today that part of my job, as a high school senior, was to give advice to people with health issues as to which vitamin/mineral combo would actually help them out. I was 17 for crying out loud! I also worked for the Waldenbooks for a while. And it was previously the Paperback Booksmith – which also had an outpost in the old New London Mall. Besides Nancy’s Carousel outside of Burr’s, there was also another candy/nut stand down by Bruckners. Both places would let you buy $1 worth of bulk candy. There was also another shoe store – Pragues, I believe it was called, that moved a few times in the mall. During Halloween, there would be indoor trick or treating at the mall, and I believe there was a parade around it as well. And, R. Rosenberg, I think the Bee in Styles was some sort of bouncy thing. I vaguely remember a similar one in the downtown Norwich branch. I bought my first lp at Caldor’s – Prince’s Purple Rain. Good times. You might just have waited on me at some time! I remember being in there, and a customer was asking for vitamin advice. I remember thinking, Gosh, the young woman working there looks like she is in high school! I remember the frozen soft serve things they served in there, too. At one point they had a sign at the front that said they served good food, not fast food. It was definately a better store than GNC. I can shed some light on all this. I used to live in the area, and shop at NT Mall and the NL Mall. There was never a cinema at NT. There was a jewelry store. I remember that octagonal display filled with jewelry. They had some nice stuff in there! A nut and candy shop also had a large octagonal kiosk in the center of the mall. There was a time when the NT mall was quite a busy place, with some nice shops. The Crystal Mall in Waterford, about 10 minutes down the road killed this mall, the NL mall and the once thriving downtown of a small nearby town. The NL Mall had as its original anchors the Outlet and Two Guys. 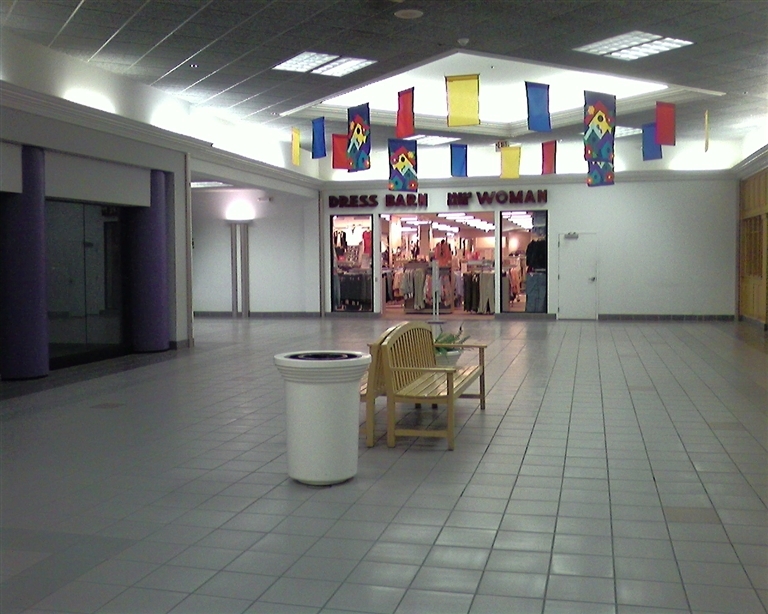 When TG went down, Bradlees moved from across the street (I-95) to the NL Mall. Outlet was replaced by another store-the area was eventually closed, and a Marshalls moved in, or maybe it was a TJ Maxx. The NL Mall was once the premier place to shop at Christmas, back in the 1970s. This is way before the Crystal Mall. The region had little in the way of shopping, so it was packed. It became an abandoned shell of itself. How sad. I’m with you on the Christmas Shopping – the NL mall was awesome around the holidays. Once in a while we’d go to Meriden, but that was about twice the distance. Dinner at the 95 house after shopping was a nice finisher. OHmygod, how could I have forgotten the 95 house? Speaking of places in NL area, anyone remember the Variety House in NL, kinda under the bridge and across from the tall housing project? I bought my mother a Chinese vase in there. Then there was Vality, in Groton. They were cool because they sold groceries AND clothes. We used to take trips to the Meriden mall, this is long before the Crystal Mall was built. My cousins liked to shop! The Chinese place in the NT mall was actually pretty good. Is it gone now? I remember there was a Chinese place in an exotic building on the road up from New London near the Mohegan toll bridge (the name escapes me-maybe China House??) that I would go to for my birthday. I always wanted the Almond Duck. Rebecca, I used to shop at that little health food store! You may very well have waited on me! I remember the sandwiches and cones and things they made in there, and the sign they put up that they made good food, not fast food. I used to like it that they sold herbal teas by the bag, this is when Celestial Seasonings was still fairly new, and expensive. Being able to purchase by the bag (or was it 5?) let me try an expensive tea for not so much cash. I remember other customers asking the young woman at the store for all types of vitamin advice. I used to think that gosh, the gal looks like she is in high school. I see that in lots of health food stores. I can’t remember if Two Legs Jeans was in the location of the pet store or if it was next to it. Anyone know? This is bringing back so many memories. Glad to have found this site! Two Legs was next to Puppy Love. You could look at the fish while your sister shopped for jeans 😀 The chinese food place was The Golden Star- I think it’s gone now. China House (aka Pings) is still there near the casino. YUP! I remember looking at the fish in the pet store while Mom shopped! It is so sad to see the NT mall deserted. Is anything now being done with the site? Does anyone remember the women who would always seem to have clip boards and would be taking surveys or something? When I was older, I asked one of them what she was doing. She wasn’t very nice. She explained something about taking a survey, but it was only for women. Wow, she was nasty about it. I also remember the flower shop outside of Caldors. You’re right Crowe, there was something off about the Norwichtown Mall, maybe just the fact that it was located in Norwich, which has been an economically depressed area since I can remember. Once in the late 70s when I was about 18, I was wandering around Caldor by myself, and a young guy started following me very closely, insisting that I had drugs on me … and that he wanted to buy them. I kept telling him I didn’t have any drugs and to leave me alone, but he kept following me, until I was almost ready to cry. Finally he left me alone. I don’t know whether he was a narc or just a drug-crazed young person. 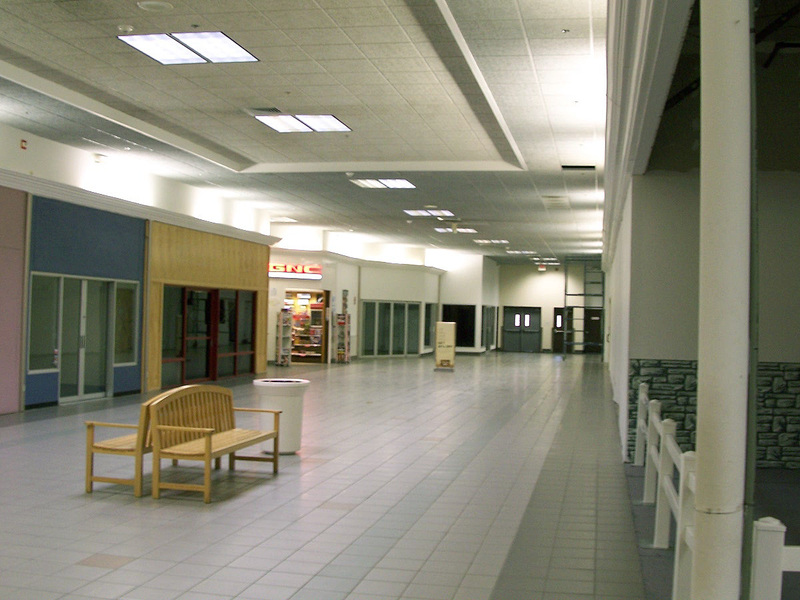 Anyway, that was the Norwichtown Mall for you …. although I did spend quite a number of hours there with my kids in later years, as depressing as it was. The bookstore was pretty decent, and we stopped often for Chinese food. Now I live in Florida, and would give anything to go back to those days in old Norwich and New London, as seedy as they were in the 70s and 80s. Ahhhhhhhhhh….my first job. What great memories. I was “the candy girl” in the evenings at W. T. Grants from 1973 to 1976. That is if anyone rembers bulk candy departments, where your candy was taken from large bins and weighed for you. I trudged many a cold dusky afternoon from NFA wearing a skirt and boots in snow with my friend Keith who also worked there in the mens department. The store was eventually renamed Grant City and then closed after the company filed for bankruptcy. I believe Grants closed their doors sometime in 1976 and was transformed into that pit they called Caldor. As former Grants employees we were all promised jobs after resubmitting applications, but that never happened. Just as well I might add. But, as for the mall in general. It was awesome. It had everything you could want. Big box (Grants) at one end, grocery at the other, better mens and womens clothing in between. There were a few eateries, books, cards, jewelery, shoes and even appliances in the mall. It was kept clean and bright and quite frankly people were not as complicated or needy back then. I will never forget the flooded parking lot every spring, learning to count back change (as this was before computerized registers), the first calculators coming out and opening the latest albums to spin on the turn table to draw the teens into the record department. Thank You Norwichtown Mall. remember when Nathan’s opened in Caldor? @Bonnie, Yes I do remember the bulk candy counter in Grants. It looks so much more visually enticing in a glass bin than in a wrapper and the aroma was overpowering. Does anyone have a picture of the mall with Vernon Drug and Bee Bees in it’s original location? I did my first restaurant management there for quite a few years and would love to see a pic. Remember Jan Lynn…Mall Cop? I remember the Norwichtown Mall well. Tons of fun always had the best games. Before it was University Music it was called Tara Music I believe. I took guitar lessons there from a grumpy old man who told my parents I was too young to learn to play. I was eight. Caldor was the place to go for toys and records. Waldenbooks supplied me with all the necessary Cliffs Notes I needed to avoid actually reading full length books. There were two shoe stores I remember, Thom McAnn, and another one who’s name escapes me. The Sports Shack was awesome for finding that one baseball card that you had to have to complete your collection that was never really complete. This article was awesome, and the comments are like a trip down memory lane back to a simpler time. I was back in Norwich this past Christmas and it’s just sad how there’s really nothing there anymore. I think it’s safe to say you can blame Wal Mart for the demise. It totally shocks me that Benny’s is surviving. I worked at Benny’s for about 2 years. I can’t tell you how many times I had to damp mop those aisles. Management made sure that store was CLEAN. Good times. Does anyone remember the Taj dress boutique in the New London Mall? It was the only place in the area where you could get clothes for special occasions. Lots of sequins, feathers, leather and imported items. The New London Mall was built in 1968. The New London Mall was originally anchored by The Outlet department store and Two Guys department store. The first Bradlees was across I-95 in the New London Shopping center, its where the Burlington Coat Factory is now (it was cool because it had a second level below where the toys and electronics departments were). In 1970 when I was 4, I remember Styles being at it’s original location, halfway through the mall (at the bend). In front of Styles was a multi level wooden jungle gym/tree house that doubled as a bench. I loved to climb it. I remember being at the level of the store front signs. By 71 it was gone. My sister had told me that a child had died falling from it. I don’t know if there was any truth to that. This makes me want to cry.I used to go there when I was a kid, I remember the pet shop, BeeBee’s, Newport Creamery, Hallmark, an arcade, Caldores and all.I’m 22 now. And sad, a childhood memory has died.I no longer live in CT, I moved in my sophmore year to california.Now in florida. This mall could be such a great mall! Its a shame no one is willing to revive it. 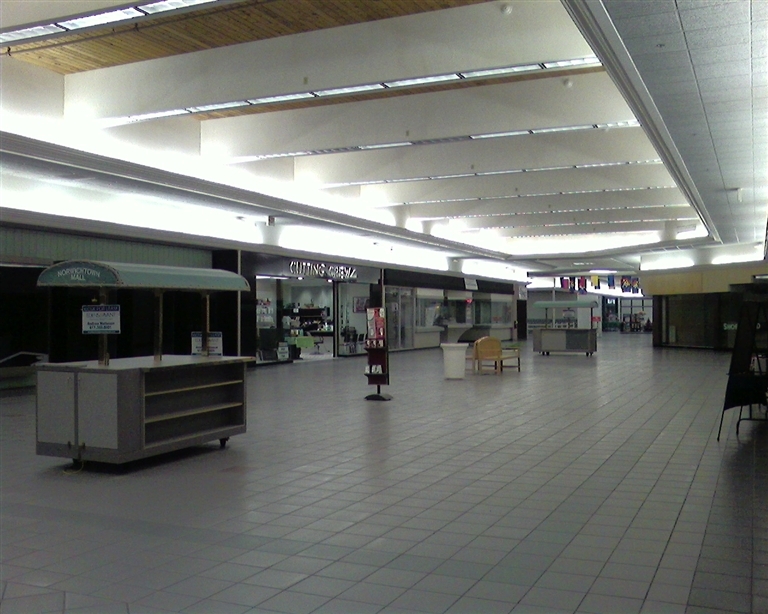 I have fond memories of Norwichtown mall. 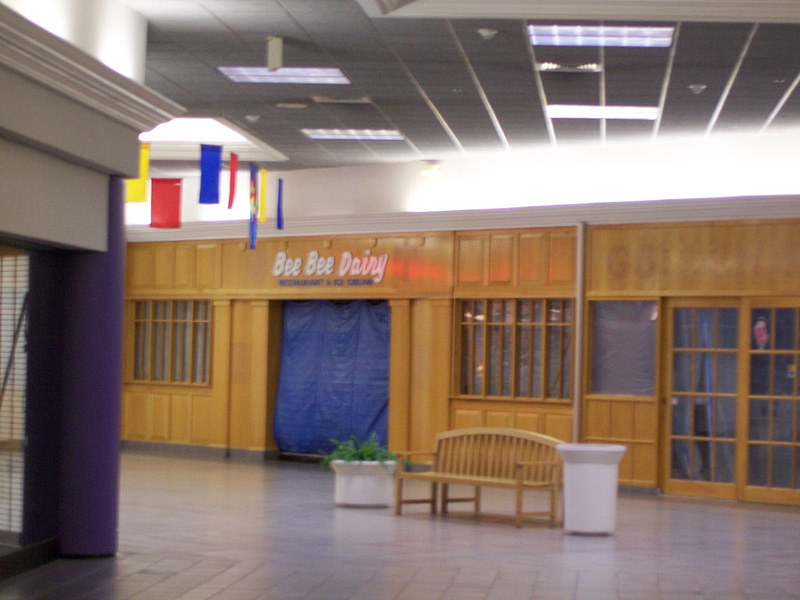 The original Bee Bee’s location was at the opposite end of the mall (farthest away from Stop & Shop). I must’ve been about 3 years old (am 46 now) when I first ate there and kept frequenting the restaurant (where it was relocated) ’til I was about 21 when I moved away from Norwich. My mom always bought my new school shoes at Buster Brown’s. There was a chair in a big sculpture of Buster Brown with his dog, Tige, that I loved to sit in. I loved the bookstore and bought my first SLR camera at Caldor’s. My stepfather worked at Caldor’s (back when it was Grants) for a part-time job and picked me out a really fat mouse as a pet for me. Of course it was pregnant and mice kept multiplying until my mom packed them all up and let them go. I remember reading the comics in Vernon Drugs (age 6?) perusing the books at The Paperback Booksmith (age 12?). I remember Debutante, the women’s clothing store and waiting for my mom to try stuff on. Burrs, McDermott’s Jewelry Store, a fabric store, and Lenny’s, a small restaurant. I think Lenny’s moved to Clearwater, FL because the logo is the same, but I’ve never gone inside to eat there. It’s a favorite hangout of the Phillies in Florida, I hear. We used to do our grocery shopping at Stop & Shop. When I was 13, I was hanging out in the parking lot of Norwichtown Mall talking on the CB radio and when my mom came out, there were a whole bunch of strangers talking to me in the parking lot. Dangerous to do that nowadays! Puppy Love was fun to go to too and I always bought a sprinkled cookie at one of the bakery counters. Wow, if there was ever a mall to kill yourself in, THIS would be it..! I mostly remember going to that mall in crappy winter days, and having “potato pancakes with applesauce” at the restaurant with the wooden paneling outside (was it really Picadilly? It was near the main entrance, more or less, across from Styles) with my mother. Those are some of the best memories of my childhood. We used to drive down there often from Putnam, it was simply somewhere to go. I remember the main sign out front had an image of a big red rose, with Norwichtown Mall in plain black font. 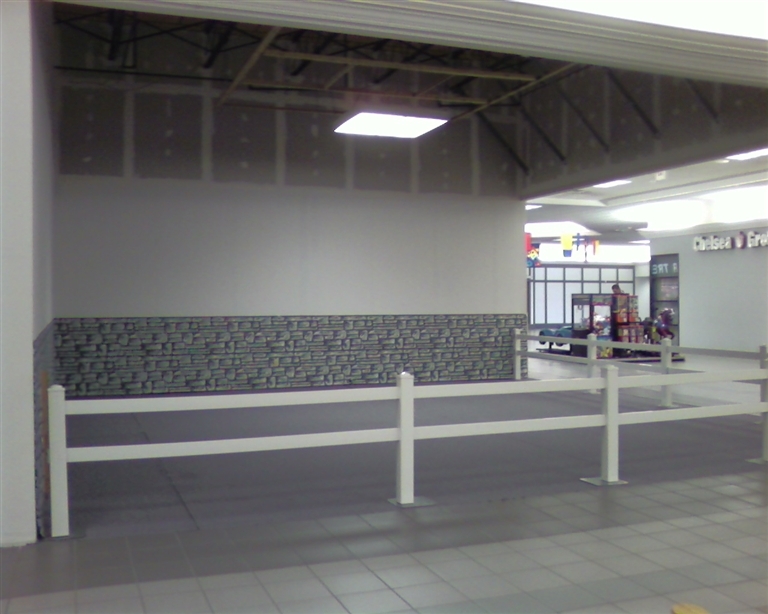 Wow, it’s amazing how much has changed in the mall since those pictures were taken. 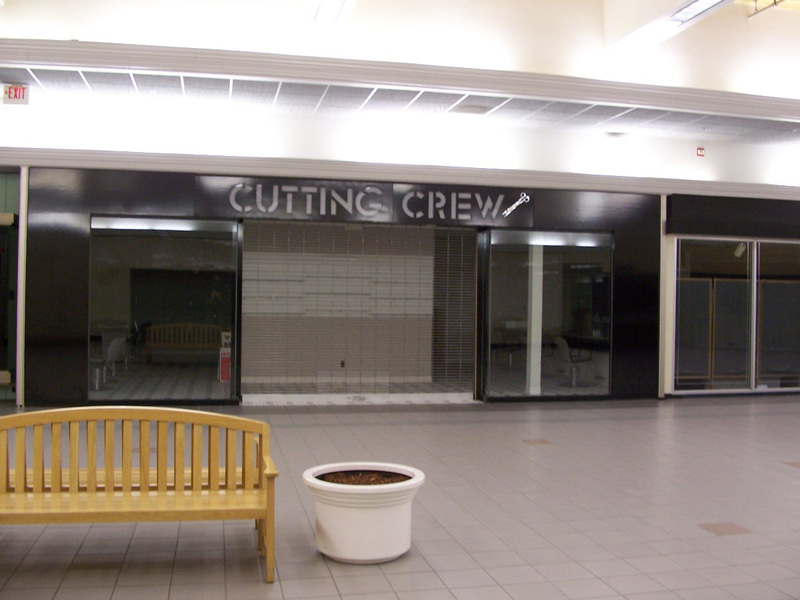 Cutting Crew, the hair salon in one of the pictures, is now elsewhere in town. Radio Shack and that smelly nail place next to it are gone too. There is a Dollar Tree, but rumor has it that it will soon go. GNC is basically the only thing in left in there other than the Dollar Tree. @NFA alum, Galivan’s sporting goods. Were else could you purchase chemistry labware and a kickball in the same place. @NFA alum, Correction. The sporting goods store name was Campbell’s not Galivan’s. Don’t know where I got Gailvan’s from. There is so little to do in positive ways of entertainment and social gathering in Norwich. I heard they may put in an outdoor mall. Just not the same though. We have outdoor malls here in Arizona. Definitely not the same. Also, I noticed a lot of people left Norwich. Norwich itself may not change much, but the culture of the town, cost of living, and influx of transients makes me reluctant to even call it “home” anymore. I always thought it awesome how everyone seemed to know everyone and was related to so and so. My grandparents went to school with her grandparents, etc. I went back for a short time and was treated like an outsider … by outsiders, if you can believe that one! 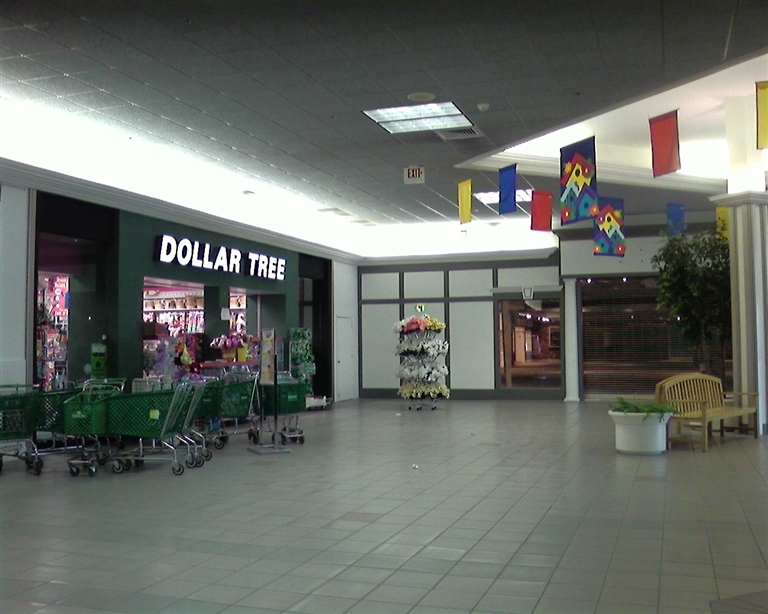 Currently the only store left is the dollar store, and the entire middle of the mall is no more, sectioned off by a big divider that cuts off at the edge of the Dollar Tree. I guess the planned change to an open strip mall is underway. caldors…….late 70’s……bomb scare at caldors! suppertime,middle of the week. Yantic fire dept responds. No one trained in bomb search! Chief Kane twlls us to look in store. Nothing found. The manager is outside with his workers, and asks them to go to tere work station and look around for “something strange” one of the girls pops up and says” If I could find something strange, I wouldn’t be working here! !” The bomd wasn’t important any more…………..we all went home!!! Happy Ending! Update in Nov 2012, this mall is being torn down completely, to be replaced by an open air mall. It should be finished some time in 2013. Unfortunately it looks like it’s going to be crap even in its new incarnartion. 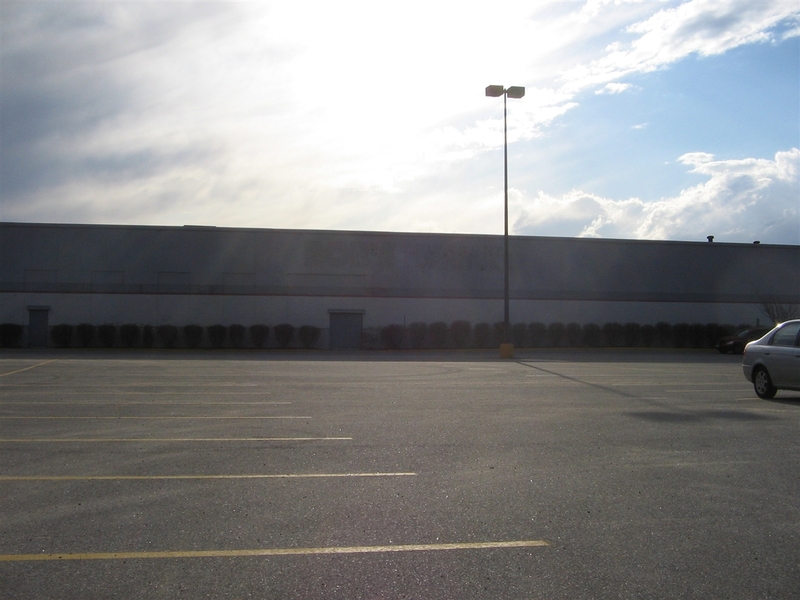 Open air malls are bad enough, but the large anchor tenant was revealed to be Big Lots in Norwich Magazine, and that mix of stores isn’t really going to lure people there. It was very sad to see it torn down, and I feel yet another part of my memories have been torn down with it. Now I can’t even look at where Tons of Fun used to be. Construction seems to temporarily have halted too, due to both Hurricane Sandy and a work order stoppage, leaving the open scars of the half-gutted building still up. Norwich as a whole seems to be slowly decaying, even as they add new things. Increasingly there’s nothing at all to do here. I have a correction for you about the old New London Mall . The anchor stores Were Two Guys ,and the Outlet Company, which was a womans clothing store . Bradlees was located across the highway in a open mall where a Sears store was. Sears moved to the Chrystal mall when they opened, and Bradlees moved into the space where Two Guys was after they went bankrupt. After the Outlet company , that end of the store was vacant until Marshall’s came in the early 1980s. The Outlet sold much more than women’s clothing. Upstairs they had a books section, and housewares, too. I grew up in Montville so have spent my fair share of time at both malls but more-so the Norwichtown Mall. I remember there used to be a magazine/trinket shop in a glass-style house right in front of Caldors as you entered the mall. I don’t remember the name but I spent plentiful time reading all the available wrestling magazines on the bottom shelf while occasionally sneaking a peak of a little of the good stuff on the top shelf. Then Vernon Drugs had the same deal, wrestling mags on the bottom and girlie mags along the top. That was my whole adolescence, wrestling & dirty magazines. I was never into the arcade but they did have a lot of games. Tons-of-Fun had the ramp that went up a level so you could play more games & get a view if the whole arcade. I remember when the Sport Shack was exactly that, a shack-style kiosk along by McDermott Jewelers. Bought lots of Sox & Celts gear there. As of June 2014, the mall has been rebuilt. It’s now a small, open air design. The anchor store is a Big Lots, with a Petsmart, a Dollar Tree, an Anytime Fitness, a Chinese restaurant (I think a remake of the old Pagoda across the street,) and a few other stores. 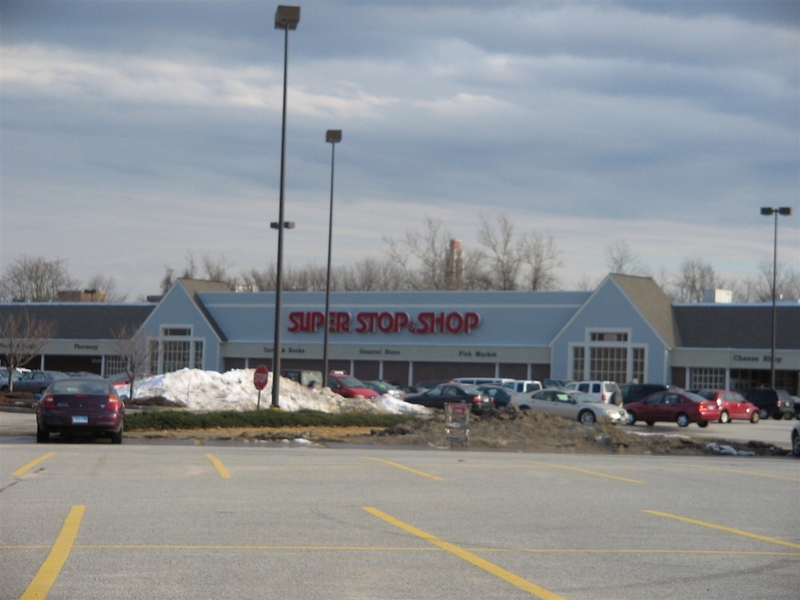 The stop and shop and dress barn are the same, but not a trace of the old interior mall exists. I grew up in Norwich and in the early and mid 80’s frequented the mall as any teenager would. I shopped, hung out and was a waitress at Bee Bee Dairy. The mall has undergone a great uplifting remodel and revival. Thee’s a bunch of fun businesses that have moved in as well. I’m proud to say, at this very moment, I am ready to sign a lease with the mall to open a new restaurant. Ironically, it will be located exactly in the old resting place of Bee Bee Dairy. I worked there for 10 years…so it makes me proud and happy to come full circle. Our new place will be a sit down establishment serving American Grill foods and dinners. We will also serve breakfast. Norwich is desperate for a good sit down breakfast! If everything checks out, it will be named Jack Abby’s Grill & Tap. We’lll be situated right next to the Backus Medical Center, which is right next to Dress Barn. Cheers to a long prosperous life for “Norwichtown Commons” -old Norwichtown Mall! You mentioned the New London Mall. Bradlees and Sage Allen were never in the New London Mall. It was first anchored by The Outlet which was the big department store out of Providence which was later bought out by Edward Malley out of New Haven, CT. I worked part time at Sage Allen in Hartford and Old Saybrook was the closest to New London. Bradlees was across the street from the mall.